The last day of the year and it is pouring with rain on the south coast. I ventured out to Waitrose which was packed and now staying in for the rest of the day. I made a few Thank you cards using the lovely Blooming with kindness stamp set. The bloom is beautiful and the set comes with 5 sentiments so is quite versatile . I hope that you are all enjoying the Christmas break. I ventured to the sales on Friday, bought a new iron, some Christmas crockery and some towels. 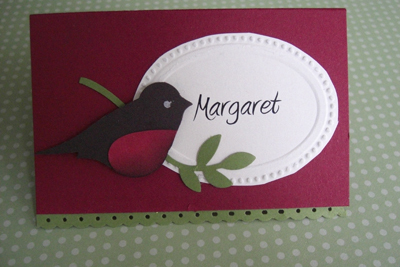 It is lovely to have some extra time to o some crafting so I have a New Years card to share with you today. I have also made a couple of thank you cards which I will show you tomorrow . Sorry I haven't posted for a while. We have had broadband issues and I have been really busy crafting so not a lot of spare time. 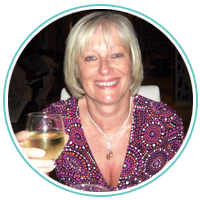 We are going North tomorrow to spend Christmas with our eldest daughter and we are all having lunch with Felicity and John who are my daughters future in laws , so no cooking this year . I have just made a Black Forest Trifle to take with us. There are going to be 9 for lunch so I have made table gifts to take with us. 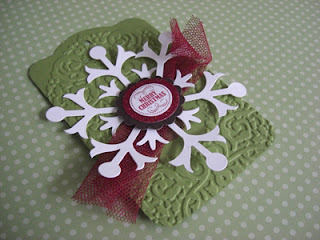 They were made using the Stampin up cone die and then lots of different punches for the shapes for Santas face. They are just big enough to hold 3 Ferrero Roche so I hope everyone will enjoy them. Yesterday we held our " Bags Tags and Boxes " at Valley Park Community Centre where we demonstrated projects that could be used for Christmas gifts. We had lots of projects for the ladies to do and we worked them quite hard because several of them were still with us nearly an hour after the event was due to finish. We either gave them too much to do or perhaps we talked too much - a bit of both I think, but they all seemed to enjoy themselves and all took home lots of goodies. I am going to show you a few of things we did in this post and will be back tomorrow to publish the rest, so please pop back tomorrow to see more lovely projects using the products from Stampin up. I am sure that your family and friends would be pleased to have their Christmas goodies wrapped up with any of these projects that we made at the weekend. Please come back tomorrow when I will post some more of the goodies that we made. A new challenge website has just started " Addicted to Clean & Simple" and their first challenge is for cards with a Snow theme. Well we haven't had any snow yet but the rain just has not stopped and it has been dark all day so the photo is not very bright but this is what I have produced. The embossing folder is one of my favourites and when teamed wth the snow flurry die it works very well . Hope that you have a good weekend - try to stay dry!! I went to my first Stampin up Convention in Germany over the weekend. I had a really good time, met lots of lovely ladies, did lots of swapping . My head is now buzzing with all the project ideas that I saw. I need to finish my Christmas cards so that I can then enjoy making some of the projects that we were shown over the course of the weekend. Here are just a couple of the projects that were on display. I love this frame and I think that my youngest daughter would like something similar in her bedroom﻿. You could also come to the convention in Manchester if you were to join Stampin up as a demonstrator. It is a good chance to enjoy your hobby, share your ideas with others and earn a bit of money in the process. November is a really good month to join as receive additional benefits . If you would like me to give you further information and tell you about all the rewards please contact me and I will be happy to explain everything. Please come back later in the week when I will show you more of the lovely projects from convention. Yesterday I posted some of the examples of cards that Aly had designed for the ladies that attended the Christmas event that we held on Saturday. Today I am going to show you some of the examples that I designed. Sorry that some of them are a bit blurred, but I am sure that you get the idea of some of the lovely cards that you can make with the great products from Stampin up. The new Ornament Keepsake set is one of my favourites at the moment. There are lots of different shaped ornaments to use and the Framelits which cut the shapes out are brilliant. I am going to the Stampin' up convention next weekend which is being held in Mainz, Germany. I am really looking forward to it as it is my first convention and I haven't been to Germany before. I am sure from all accounts of previous conventions that it is going to be a great weekend. I have still have a few swaps to finish off and some roomie gifts to do but I am nearly ready. Yesterday we held our Stamp - a - stack in Valley Park Community Centre. The ladies made 12 Christmas cards, covered a tin and also made a little stand up Santa - he was so cute, and they all went away with a bag of goodies . They were kept so busy during the day that is was really very quiet as they were all busy concentrating and beavering away. These are the cards that Aly had prepared for the ladies to do. Come back tomorrow when I will show you the cards that I had prepared. The Perfectly Preserved stampset from the Autumn/Winter catalogue is the perfect stamp for any autumn project especially if you make jams or chutneys. This set is part of the Orchard Harvest suite which include Designer Series papers, Perfectly Preserved stampset, Cannery Set Framelits and Fabrics. 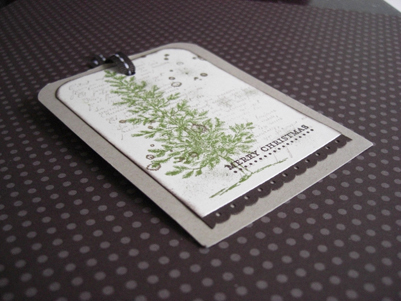 At our last Stampin up event we used the Designer Papers from the set when we produced a mini album. 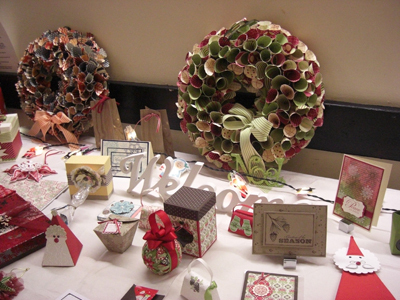 I also created some cards and gifts that were on display for inspiration for the ladies. Come take a look at what I produced. You can purchase the bundle you get both the Stampset and the Cannery Set Dies and get a 15% reduction.